This painting tells of a young Tjungurrayi man who fell in love with a Napangati woman, however she was the wrong skin group and was not allowed to marry him. 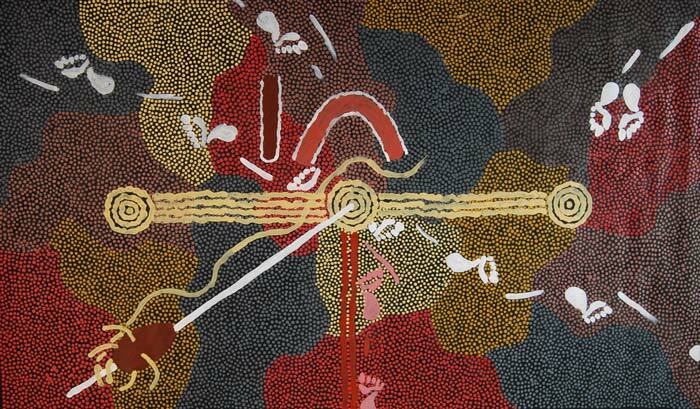 The Tjungurrayi man returned to his campsite to perform love magic. He created a painting in the sand and cut his hair. He began to spin his hair into an unbroken length of string and then sang a love song to the woman. Throwing the spindle towards her, and with its long length of spun hair, he drew her to his campsite The tribal elders then recognised the Tjungurrayi love-magic as being too strong and they approved the marriage as a result. The iconography in this story depicts the man, shown as the U-shape, with the spindle and its long hair-string, together with the footprints of the couple. Clifford was born on Napperby Station. From the 1940s he carved and decorated weapons such as boomerangs and bullroarers with landscape scenes for sale to tourists. Clifford and his brother Tim Leura, also a famous artist were moved to a new settlement at Papunya, which had been established in 1959 because of the British atomic bomb tests in the Western Desert from 1955 to 1963. Clifford and Tim Leura became members of the first group of artists to join Geoffrey Bardon’s painting group and the newly formed Papunya Tula Artists company. Clifford later became the Chairman of Papunya Tula Artists. A very quiet private man, he was generous in his gifts to his extended family. Clifford is survived by his artist children, Gabriella, Michelle and Lionel.